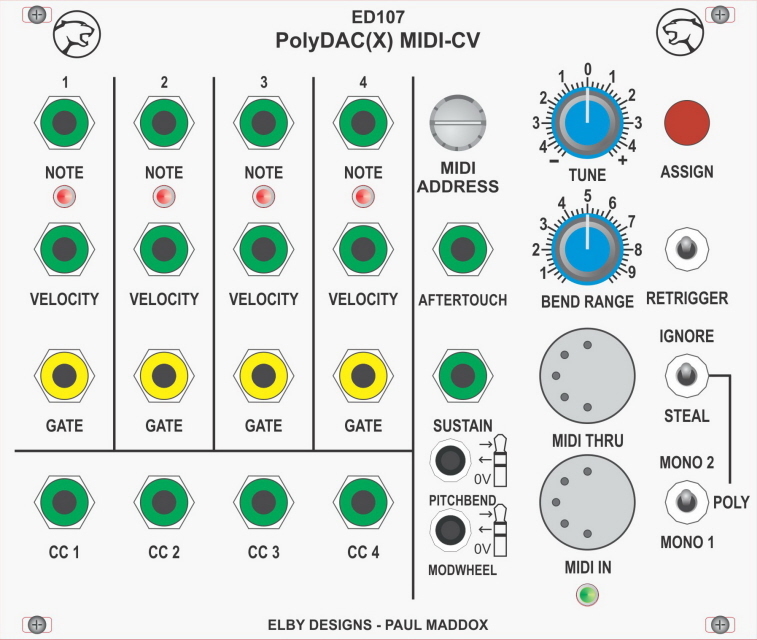 The PolyDAC was a 4-channel MIDI-CV Converter originally designed by Paul Maddox and later released as open source. The current ED107 firmware uses a 'Regular Cyclic' Mode for MIDI Note assignment. Incoming MIDI notes are assigned to the next free voice (even if it is the same note played repeatedly). So, each time you play a note it will step through and assign channels '1' then '2' then '3' then '4' then back to '1' again as you play. If you hold a note, new notes will be assigned to the next voice in that order that is free. If all voices are already assigned to held notes, the next note will use the lowest voice held.